A gas main break was reported Tuesday night at the Meadowbrook apartment complex in Bay Terraces. 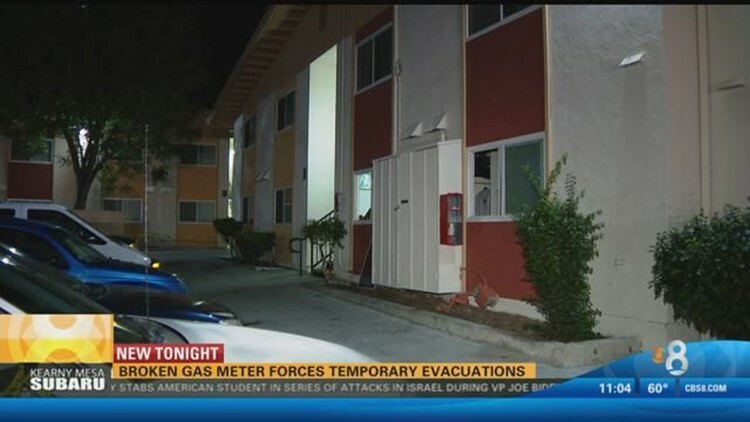 SAN DIEGO (CBS 8) - A broken gas meter forced temporary evacuations at an apartment complex in Bay Terraces. The break was reported Wednesday night in the 400 block of Deep Dell Road. Firefighters responded and began evacuations at the roughly 200-unit complex while SDG&E crews worked to shut off the gas. Officials are not sure what caused the damage, but said the broken equipment was privately owned sub-meter what was made out of PVC. Residents were allowed back inside and crews are working to restore gas service to the rest of the units.